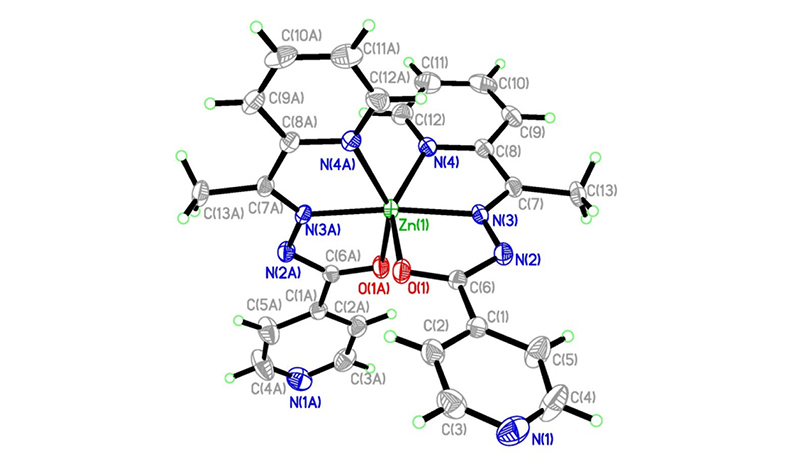 Two mononuclear zinc(II) and manganese(II) compounds, [ZnL2] (1) and [MnL(HL)]ClO4 (2), where L is the monoanionic form of N’-(1-(pyridin-2-yl)ethylidene)isonicotinohydrazide (HL), and HL is the zwitterionic form of HL, have been prepared and characterized by elemental analyses, IR and UV-Vis spectroscopy, and single-crystal X-ray crystallographic determination. Compound 1 contains a neutral [ZnL2] complex molecule. Compound 2 contains a [MnL(HL)]+ complex cation and one perchlorate anion. The metal atoms in the complexes are in octahedral coordination. The hydrazone ligands coordinate to the metal atoms through the pyridine N, imine N, and enolate O atoms. The compounds were investigated for their antimicrobial activity against Staphylococcus aureus, Escherichia coli, and Candida albicans.